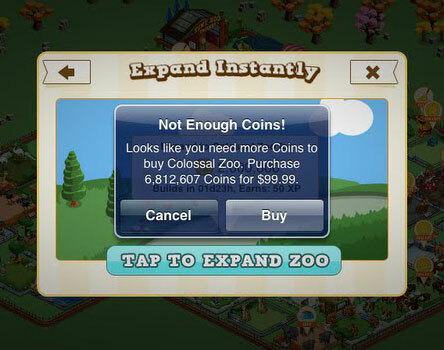 At $99.99 each, Tap Zoo purchases can add up quick. If your child has made an unauthorized in-game purchase on your iPhone, iPad, or iPod touch without your knowledge prior to May 1, 2013, you may be entitled to a refund – but only if you act fast. In February, Apple agreed to settle a class action lawsuit claiming that the company made it far too easy for your kids to spend your real-world money through in-app purchases made without your permission. Today, the court has made a claim form available, giving you your chance to get a small piece of the multi-million dollar settlement pie. It’s unknown exactly how many children wound up making exorbitantly large in-app purchases without their parents’ permission, but there are plenty of horror stories. One family in England saw their 8-year-old son run up $1,500 worth of real-world charges for in-game virtual donuts for The Simpsons: Tapped Out. Another family saw a similar bill after their child bought a collection of digital animals for Tap Zoo. Unfortunately, Apple’s security procedures for preventing these types of unauthorized purchases were woefully inadequate, sometimes not even requiring the re-entry of a password. The amount of money each individual is able to claim from Apple is somewhat limited, and will vary greatly depending on the circumstances. If a minor made less than $30 in in-app purchases on your account, then Apple is offering you a choice between a $5 iTunes credit or a credit “equal to the total amount of Game Currency that a minor charged to your iTunes account without your knowledge or permission within a single forty-five day period.” If you no longer have an iTunes account, or if charges greater than $30 were racked up without your permission, then you’re entitled to seek a cash refund. Larger claims will require more detailed descriptions of exactly how the charges were accumulated. To get a piece of the class settlement, you’ll need to submit a claim form by January 13, 2014 – if you don’t act, you won’t get a penny and you’ll lose your legal rights to sue over the issue in the future. You can obtain your claim form package and more details about the suit by visiting www.iTunesInAppPurchaseSettlement.com or by calling 1 (855) 282 – 8111. Regardless of whether you file a claim, it’s strongly suggested that parents of young children disable in-app purchases to keep these types of surprise charges from arising. Check out Techlicious’s guide to disabling in-app purchases for step-by-step directions on protecting your Apple and Android devices.